We are proud to announce and welcome our newest New York addition to the LGTNetwork collection, The High Line Hotel. The High Line Hotel opened in September 2013. 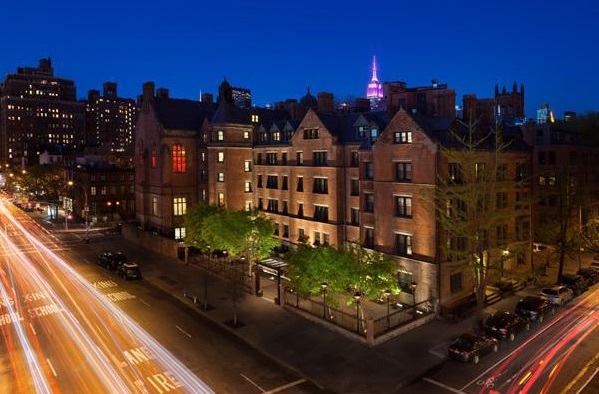 Its 60 rooms and suites are carved out of the red-brick General Theological Seminary complex, a registered Manhattan landmark on Tenth Avenue at 20th Street. The hotel is located in Chelsea, adjacent to the iconic High Line “railroad-line park,” dozens of restaurants, clubs and the city’s hippest art gallery neighborhood. Behind the hotel, the secluded gardens and additional 19th-century buildings still quietly function as a seminary of the Episcopal Church. The High Line is not just another cool hotel, it is utterly unique. When it was being created by MCR Development LLC and The Brodsky Organization, instead of opting for standard hotel furnishings, design firm Roman and Williams undertook a massive project of scouring stores, barns, warehouses and flea markets up and down the East Coast. The result is “collegiate gothic,” with every room, suite, corridor and public space furnished with Victorian or Edwardian antiques, period art, Tiffany-style lamps, rewired 1920’s dial telephones and a vast collection of authentic Oriental carpets. The crown jewel of the High Line Hotel is the Refectory, a 3,500-square-foot cathedral-like, Gothic paneled hall reached by an immense baronial marble staircase. It soars four stories to a gabled gilt encrusted roof, complete with minstrels’ gallery and towering windows. The space has already been utilized for a variety of high-visibility media and fashion events. The uniqueness is not just within the hotel. On Tenth Avenue, turn-of-the-20th-century gas lamps line the sidewalk and entry. A shiny 1960s Citroën truck serves coffee and snacks to New Yorkers, a water course gurgles, and garden chairs and tables entice guests to linger (in winter, complete with heaters and cozy blankets). The coffee truck is manned by Chicago-based Intelligentsia, which also maintains a coffee counter in the High Line lobby to provide all day drinks and room-service breakfast. For more information, visit www.thehighlinehotel.com.